Concept, Illustration and Art Director in San Francisco, California. Clients include: Parallax Media, Nickelodeon Books, Random House, Disney Junior, Disney Publishing, Disney interactive, Lego, Pocket Gems, Ghostbot, Zynga, Electronic Arts, and more. I grew up on military bases all over the US. My father was a career soldier and also taught English Literature at West Point Military Academy. Additionally, I was deeply influenced by both my mother, a textile artist, and my grandmother who was an art teacher and painter. While I was growing up, I was always so inspired by my grandmother's passion, displayed everywhere in her apartment that was covered floor to ceiling with her paintings, even fan art! She introduced me to many techniques and interesting ideas in the art world that I'd not heard about elsewhere. I attended the American Academy of Art in downtown Chicago, and joined the historic 'Palette and Chisel' Art League, where I met the most incredible painters who deeply inspired me, and still do to this day. After graduating from the American Academy of Art, I began working at Calabash Animation on commercials and short films. Since moving to San Francisco eighteen years ago, I've been working in games, animation and illustration. 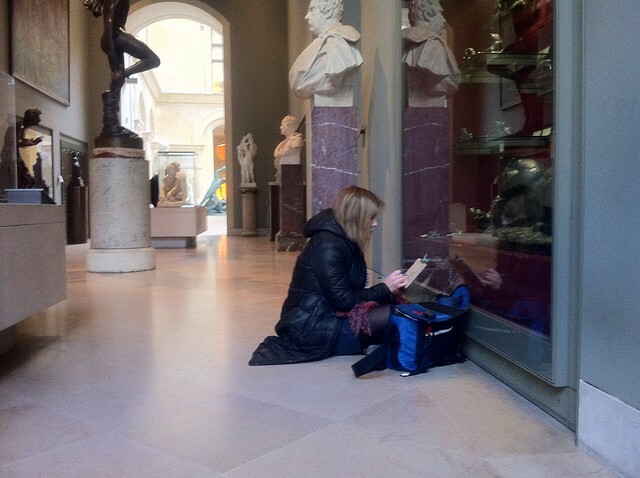 Sketching the Bayre sculptures in the Louvre. Bayre is one of my very favorite sculptors. Sketching the amazing Roman sculptures and architecture in Saintes, France. I really enjoy learning about Greek and Roman history.